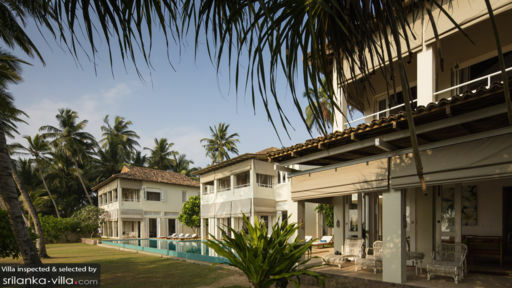 Found a few kilometres from Bentota and Kosgoda, Sri Villa is a pristine Sri Lankan home with modern comforts encapsulated in each of the villa’s many living spaces. With a beach that well may be a private beach as it remains mostly deserted, the villa is a proper beachfront location where a few steps will take you to the sandy shores. The sprawling property is, in fact, a complex of three individual villas – Villa Nisala, Villa Sagara, Villa Araliya – with nine bedrooms between them. Extending amenities such as outdoor dining, private swimming pool, and endless views of the Indian Ocean, Sri Villa would make for a great choice if you’re planning a private event and travelling with friends and family! Although each of the three villas offers something unique to guests, they do have some common attributes in the form of terraces, balconies, or verandas accessed straight from the bedrooms. Offering mesmerizing ocean views, the bedrooms at each villa are air-conditioned and designed with pastel tones dominated by white. The cooling ambiance ensures the tropical warmth isn’t too much to handle. Villa Nilasa has two bedrooms suites with en-suite bathrooms king-sized beds; Villa Sagara has three king-bedded rooms with en-suite bathrooms; Villa Araliya has four bedrooms, two of which are master suites with en-suite bathroom, one a junior suite with attached bathroom, and the last with single beds and shared bath. Outdoors at Sri Villa is quite enrapturing what with the azure blue of the ocean contrasting first with the white, sandy beach and then the emerald green gardens of the villa. With this beguiling view each day, there is not much you’d wish to do but to lay back on the many sun chairs on the deck and breathe in the fresh tropical breeze. A massive, 27-metre swimming pool is a convenient vantage point for ocean-gazing as there is nothing obstructing the view. Palm trees sway dangerously, yet majestically, in the wind, and offer a panorama that is unbeatable. 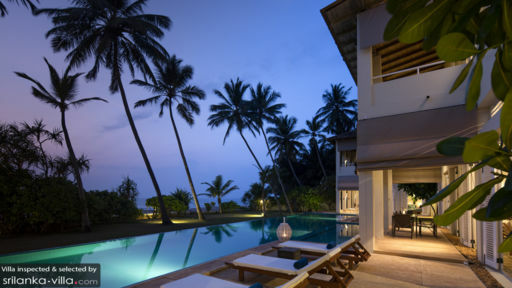 Sri Villa, although offering ample modern amenities still retains a bit of the Sri Lankan roots it represents. With slatted-doors, high-soaring ceilings, and whitewashed walls, you can immediately note the relevance of the slight details. Besides a gorgeous scenic view, the villa provides several nooks and corners where guests can hideout for some peace of mind. There are terraces furnished with recliners or alfresco dining tables for breakfast in the open! Villa Nisala has its own well-equipped library with books, DVDs, etc. for you to spend your evenings immersed in either of the two. 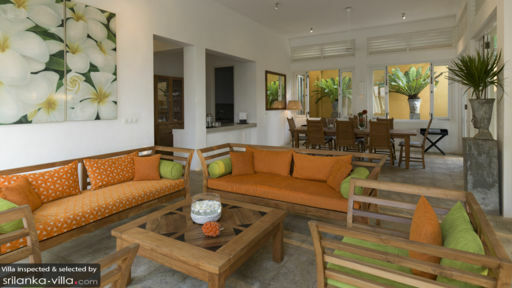 Villa Araliya features spacious living and dining area for its guests, since it is the largest of three villas. There are quite a few comfortable spaces, furnished with sofas, chairs, ottomans, etc. complete for your comfort. Dine outdoors beside the beach, on the gardens, or indoors, it depends on what you choose that particular day! There are a host of cuisines on offer and you can pick from Asian to Western whatever the mood may be. Sri Villa is a fully-functional holiday retreat with three villas that are not only comfortable to live in but also recreational with amenities like yoga, massages, and special cooking classes on offer. Guests can request for high-tea in the evening or a delicious meal by the ocean, which would be charged additionally. Complimentary bicycles are provided for a ride along the shore, or you can rent out boats to take out on the waters! Just minutes from Bentota, the villa is in a sparsely populated area giving you privacy and your own slice of paradise. Enjoy a serene getaway from the rest of the world and when you start missing civilisation, the larger attractions in Bentota and Kosgoda are not that far.